Sally Todd was born February 23, 1932, to Earl George and Frances (nee Harper) Bennett, in Watertown, NY. 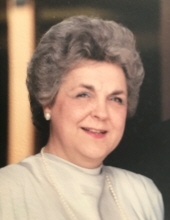 She died March 27, 2019, at River Glen Assisted Living in St. Charles. Earning both her bachelor’s and master’s degrees from National College of Education in Evanston, IL, Sally was a life-long educator. She was an elementary school teacher in the Deerfield Public School District for over 35 years. Upon retirement in 1994, she served as the President of the Illinois Retired Teachers Association. Sally always found time to tirelessly lend her many gifts and talents to her family, friends, and the church families she was a member to. Above all, she adored her grandchildren. She is survived by her loving husband of 63 years, William; her beloved only child, William (Norma); grandsons William and Peter; sisters Cynthia and Elizabeth; and many nieces and nephews. Visitation Saturday, April 6, 2019, from 1:00 PM until the time of funeral service at 4:00 PM at Glueckert Funeral Home, Ltd., 1520 N. Arlington Heights Road, (4 blocks south of Palatine Road) Arlington Heights, IL. Interment will be held at St. Peter UCC Cemetery in Skokie, IL, at a later date. In lieu of flowers, memorial contributions may be given to Alzheimer’s Assn. Greater Illinois Chapter, 8430 W. Bryn Mawr, Suite 800, Chicago, IL 60631 or American Diabetes Assn., 2451 Crystal Drive, Suite 900, Arlington, VA 22202, www.diabetes.org/honor. Funeral information and condolences www.GlueckertFH.com http://www.glueckertfh.com or (847) 253-0168. "Email Address" would like to share the life celebration of Sally Todd. Click on the "link" to go to share a favorite memory or leave a condolence message for the family.